By operating a background change you can completely reinvent the context and appearance of an image. reaConverter's background change feature works particularly well in the case of images which include a well-defined contrast between the background and the subject, so that one or several elements can be clearly distinguished in the foreground. While most people think changing the background of the image requires a complicated cropping procedure, where you need to manually select the desired subject and separate it from its background using a piece of advanced graphics editing software, with reaConverter this operation can be done in seconds. 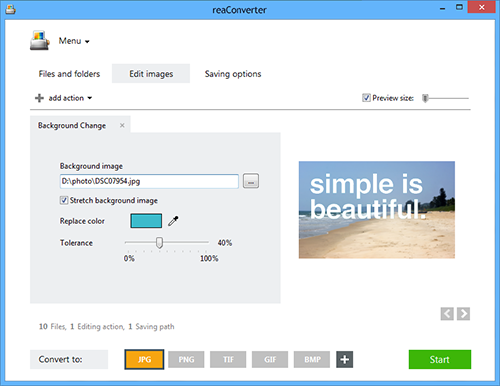 Moreover, this powerful software provides several customization tools, including the possibility to stretch the new background image, to select the area you intend to modify using an easy-to-use color picker, as well as to choose a desired tolerance for the background changing process. 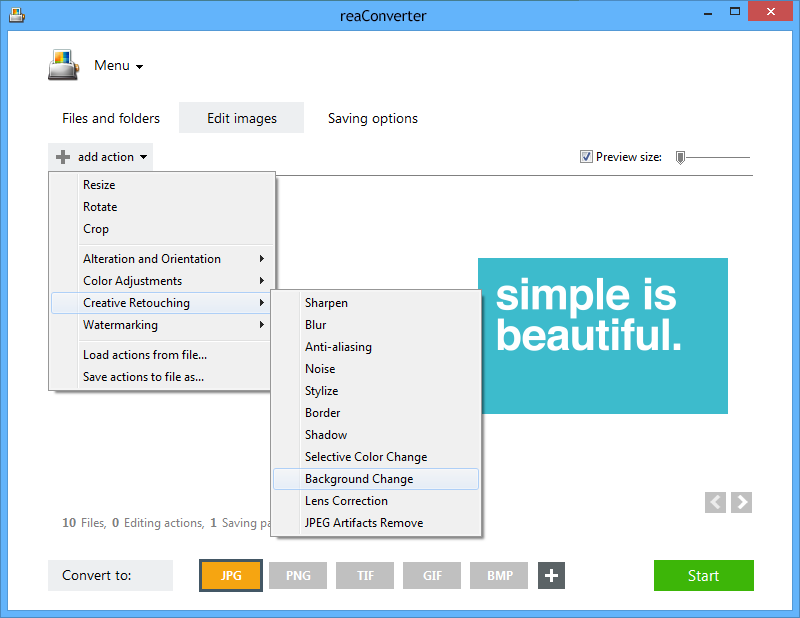 Load one or more images you intend to edit, using reaConverter's handy drag-and-drop feature or by selecting them manually. Adding entire image folders is also an option, as well as loading images from text files. You will now be able to select a new background image from your computer and stretch it if necessary. In this window you can hand-pick the color you wish to change in the background, and also opt for having a partial or an entire background change by entering a proper figure into the Tolerance box. In the Saving options tab, you can select a location for your newly edited images. Available options include saving them locally, in the source folder or in a newly created one, as well as your online folder, using your Google Drive, Box.net, SkyDrive or Dropbox account. Last but not least, you can choose to save the new files into a new image format. reaConverter supports conversion to and from a wide range of image file extensions, including both popular ones, such as JPG, PNG or TIF, and rare or archaic ones. Finally, press the Start button and your new images will soon be ready! Command-line background replacement tool is an advanced feature meant for professional use, and is available in Pro edition only.